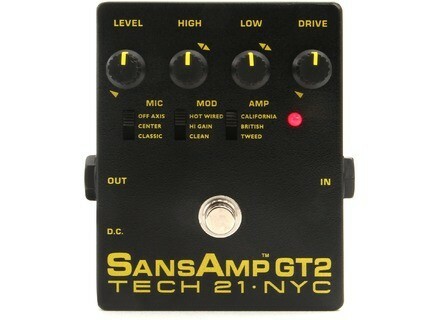 SansAmp GT2, Guitar Amp Simulation Pedal from Tech 21 in the SansAmp series. 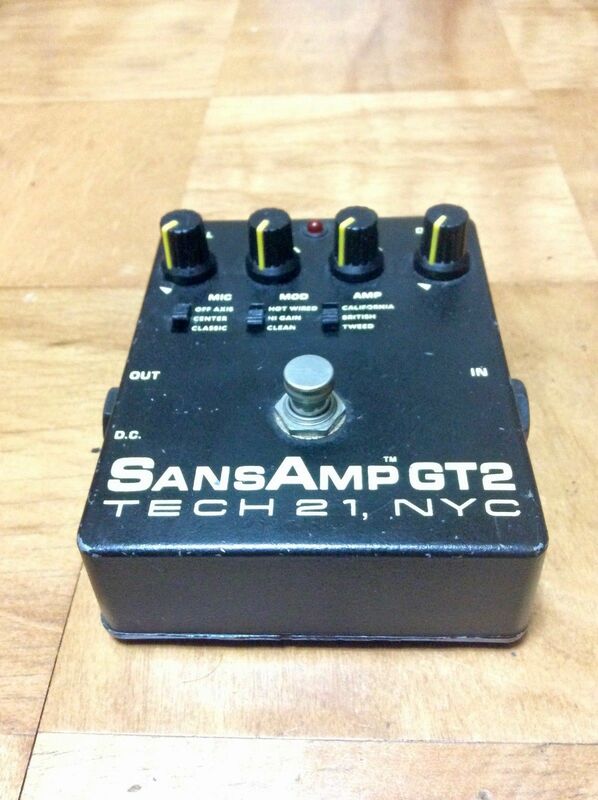 MGR/Dr.Hack-n-cough's review"Tech 21 SansAmp GT2"
what do I like about the sans amp gt2 ??EVERYTHING!!!!! it sounds just as good as "most" not all but most of the new modeling amps and at a fraction of the price!! you can take this little beast straight to a sound card or...... if you DARE put it in between your favorite old tube amp and a guitar and HANG ON!!! cause it takes any simple tube amp and turns it into a MONSTER!!!!! 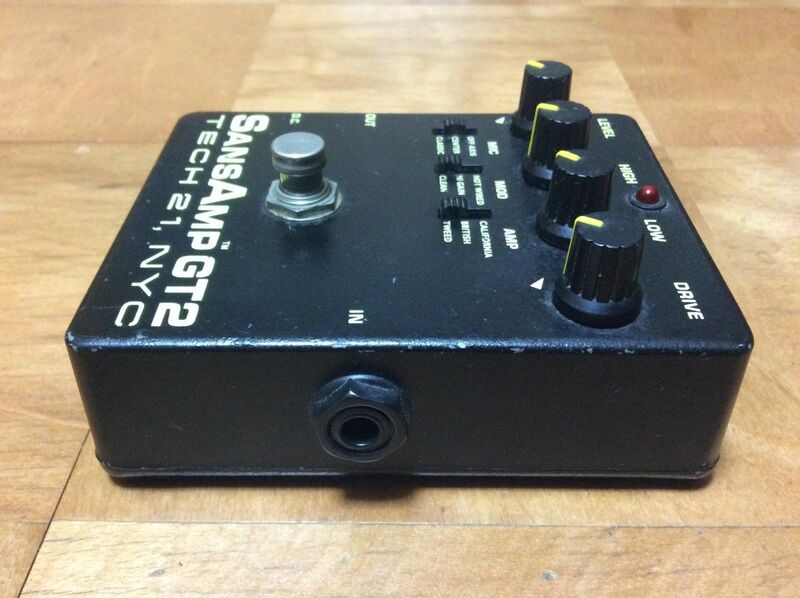 MGR/Anonymous's review"Tech 21 SansAmp GT2"
The unit was purchased through Musician's Friend for around $200 a year or so ago. Very solid and well built. Simple controls, but a variety of choices and the sweetest tube tone I've heard out of a preamp box yet - and that includes that POD! There's really not much to dislike except for the fact that you have to actually touch the unit to change amps or cabinet settings. 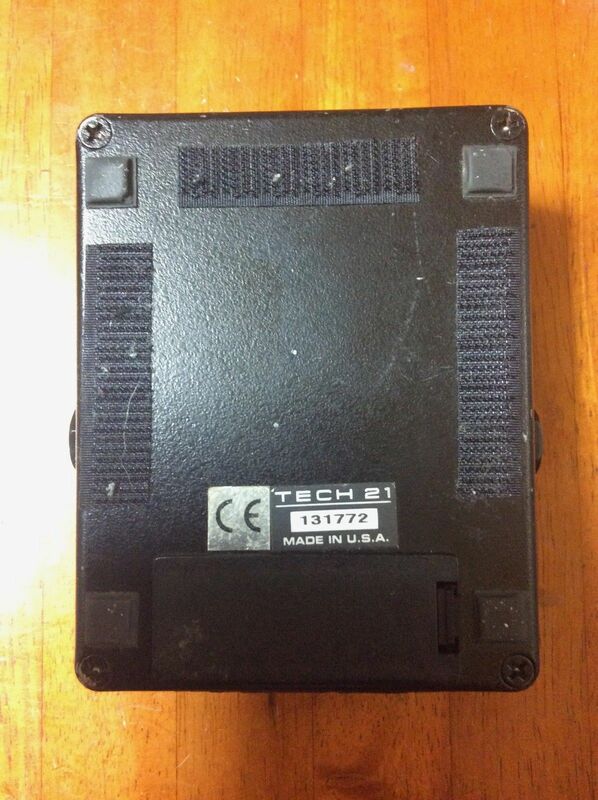 There's only one foot switch. It's great for recording, though. Built like a little tank. Everything from the knobs and the housing to the footswitch and input jacks. If you're into direct recording or playing through a PA system, I don't think you can go wrong. Although the unit doesn't include any effects it does what it's meant to do very, very well. You can always chain effects before or after the preamp. amp with: california, tweed, british settings. This is an analog preamp and/or distortion pedal with quite a few different settings of which any of them can be combined to give you analog guitar tones from clean to death metal high gain! It is a pedal, and is designed like one with a very easy to use configuration. Just set everything one at a time to how you like it. You don't really need the manual for something like this. Switching the switch in the mic section mimics how the location of a mic on a cabinet. off axis meaning just slightly off center, center being the center of a speaker cone and classic bring distance mic'ed without ambiance. Mod refers to the type of 'tube amp' setup you can have. Clean being a typical tube amp, high gain being a typical tube amp plus an extra preamp tube adding more gain, and hot wired being a super hot rodded-esque tube amp with a scooped mid-range quality. Amp of course refers to the mimic'ed type of amp you want. Tweed being a fender-like clean. British being the vintage marshall-like style and california refers to the mesa boogie-like sounds. One thing I do not like is that there is no mid control knob. Guitar is a mid-range instrument, everything guitar-related should have a mid control. Remember this is pretty much a preamp. Not really JUST a pedal, it will not really 'add' to your sound, more like it IS your sound. You can't really use it as an overdrive to layer on top of an existing sound as it will most likely just replace the sound you've already got coming out of your amp. I've tried this. I set my amp on clean, and used the pedal to get a completely NEW clean sound, I've done it the other way around. Had the amp on high gain dirt and tried to 'overdrive' the existing distortion and it was a nightmare! I've also experimented, having the amp set for high gain and setting the pedal to a clean setting, which actually pretty much turned my high gain amp into a clean amp (ALMOST!). Minus some gain hiss and whatnot. I can see this being useful for those who have single channel heads or non master volume amps, you can use this pedal to clean up your signal DRAMATICALLY. for the clean settings: They all sound great! Very chimey if needed and very clear. It's a very consistent sound also which I like. Not to mention that way I used it to clean up an amp's distortion also, which I think is unique but very very useful! as for the distortion: It's generally a bit too gritty for me, I have to set the high knob quite low and boost the low to get it sounding remotely useful. Though the analog distortion is good, it's tight and clear and every note can be heard in a chord and therefore sound amazing for tight rhythm. But the leads is where it begins to fall apart, this is where the weakness is. Chords/rhythms come out strong and tight but leads come out thin, and sterile. I also found it to be a bit noisy under high gain versus other pedals I've tried, I did use an ISP decimator to reduce any feedback/ground noise but also found I had to turn up the decimator adjustment higher than I would a regular tube amp under high gain. I think this pedal would sound great for downtuned metal. It's crisp and tight! And cleans are great too! But anything inbetween...it most likely will not satisfy. Overall it's a decent pedal for somebody wanting either extreme cleans or extreme dirt. It's good for tight rhythm work but not fluidy enough for leads and a bit sterile. It does sound quite similar to the trademark amps, I'm beginning to think that they all have a very similar build to them and thus sound similar as well. I personally would not get another one. I know how it sounds and what it would be used for, and even though it's one of the better analog distortion pedals out there right now it is not versatile enough for me. Everything has been said! 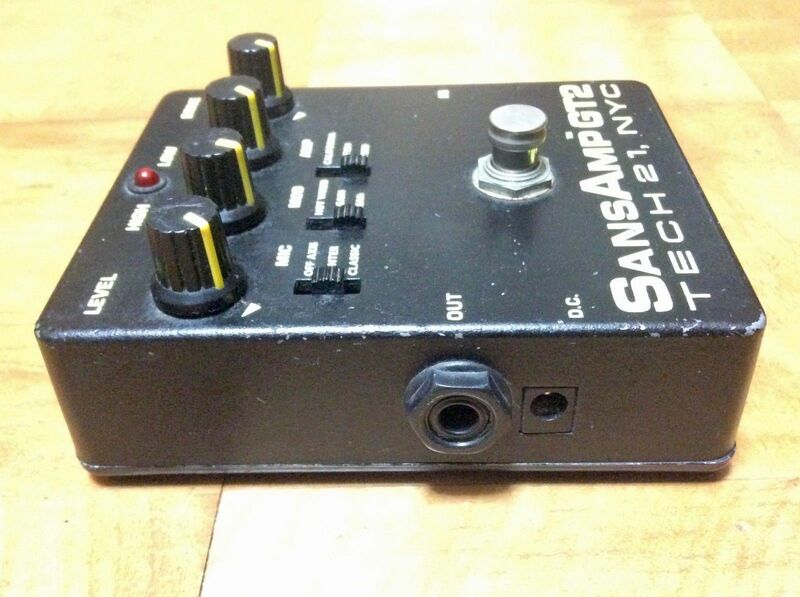 This product is not very practical for live gigs because of its size and controls. I use it with my DAW. - Guitar -> GT2 -> Behringer DI box -> mic input of my sound card. - Guitar -> GT2 -> Palmer speaker simulation -> mic input of my sound card. - Guitar -> GT2 -> VTB1 preamp -> mic input of my sound card. Currently my favorite setting is: Mic = center, Mode = clean and Amp = British. I've owned it for two days... The first thing that comes to my mind when I try to describe it is... that it's a pedal for men... it's no toy... Serious business! Effective, responsive, accurate. I bought it secondhand via the Audiofanzine website and I think I will never sell it again (I would certainly regret it). I haven't found any cons. I'm fully satisfied! 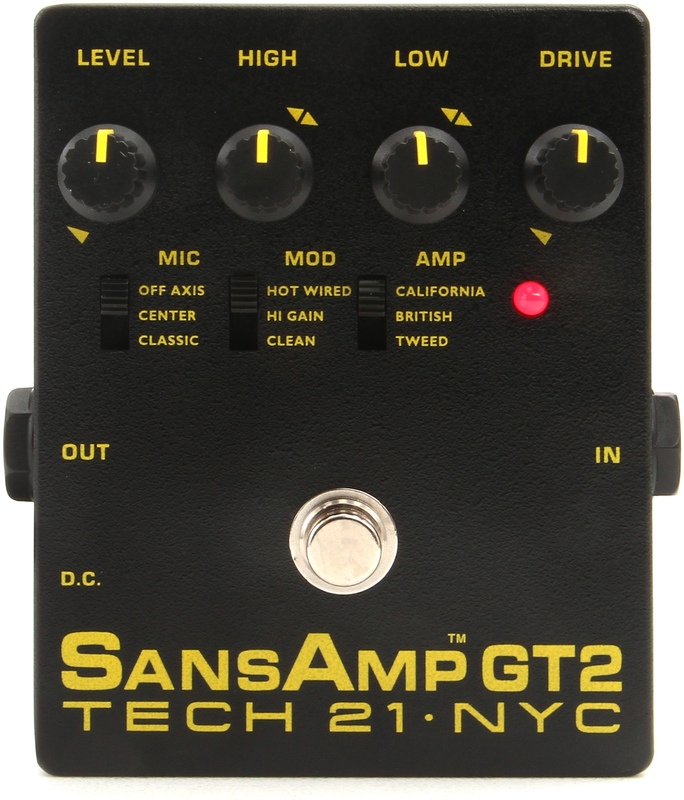 Andrew Barta started Tech 21 with a product he originally designed for his own personal use, the SansAmp.